I’m sure I’ve mentioned it before but the traffic in the major cities of Vietnam is crazy and Hanoi was of course no exception. After an uneventful train journey in more drizzling rain we arrived at Hanoi about mid-day and got a Grab taxi to our hotel in the Old Quarter. Our hotel was called Golden Moon, a very nice mid-range place with not much character but really comfy beds. First impressions of Hanoi were obviously of the traffic but that there was also a cool, quirky undercurrent that you felt as you walked past art shops, egg coffee cafes and weird looking food places. There is a huge lake at the bottom of the old quarter with a busy road that they shut off to traffic on a Sunday. It then fills with families, children doing surveys, young pop acts making music videos, circus performers, young couples and older generations all just enjoying their Sunday together. Obviously one of the first things we did was find pub street as we had heard this was a source of the Bir Hoi that we had enjoyed in Hoi An. 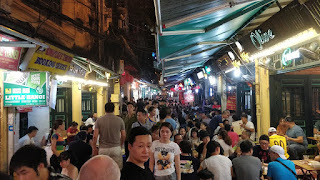 Pub street is basically a narrow lane lined with bars and local restaurants, all with their own little section of plastic stools and tables taking up most of the walking space in the lane and it’s where most people seem to head for a night out. The beer isn’t actually the fresh beer we’d expected and the prices seem to depend on their location on the short street, as the ones near the entrances seem to charge the most, or on how much you can haggle. The best ones we found were in the middle of the street and had the local beer Halida for only 15k a bottle or at the worst 20k. These also had the most energetic and cheeky boys working on getting customers in their restaurant, this could include grabbing or hugging, blocking your way, flirting, shouting or just showing you a menu. Once you sat down they would tease the other lads for not wining your custom then engage you in any banter they could and the longer you stayed the funnier it all got. It was a most amusing spectator sport and we had our favourites by the end of our stay in the city. The other amusing thing about pub street is when the Police decide to flex their muscles and bring their van down the small lane. This means all tables and chairs have to be cleared off the street and all food and drink items need to be inside a restaurant, this can be quite a problem if you are halfway through a large meal or if the restaurant doesn’t have an inside space! It generally happens a couple of times a night and although they don’t bring the van down at the weekend they still patrol on foot and only allow a couple of neat tables and stools out in the walkway. We did find the cheap places selling Bir Hoi for only 10k a large mug but these are generally served out of silver kegs on street corners, where you also find the extra-large ‘happy balloons’ and unsurprisingly a lot of backpackers. The corner next to our friends the Vietnamese Backpackers Hostel was a busy area for this. Aside from drinking we did take in a lot of sights and had a few things we’d earmarked as wanting to see. The Hoi Chi Minh mausoleum was one of them and the surrounding areas were dotted with temples, cathedrals, museums and other local interesting spots. Unfortunately, we aren’t that good at getting up in the mornings, especially if we have indulged the night before, and the opening times for things isn’t correct on google, so we struck a few fails whilst we were there. The mausoleum is only open between 7:30 and 10:30am, a lot of the museums close for lunch and they aren’t open at all on a Friday or a Monday! The temples are always open though and it was nice to see some big Chinese ones here – Confucianism and Taoism, alongside the Christian and Buddhist ones. The train tracks in parts of Hanoi carve straight through the busy streets and it’s not uncommon for houses or cafes to be right next to the tracks. 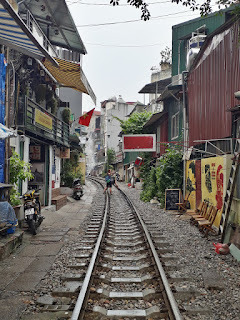 The local residents use the tracks as a driveway for their bikes when going home or to have their small ceremonial fires - a Taoist memorial tradition. A worthwhile trip out is the Hoa Lo Prison, which was built and used first by the French to hold Vietnamese political prisoners and later to hold the US prisoners from the Vietnam war. Only part of the original prison exists today as a museum, but it was a fascinating few hours. 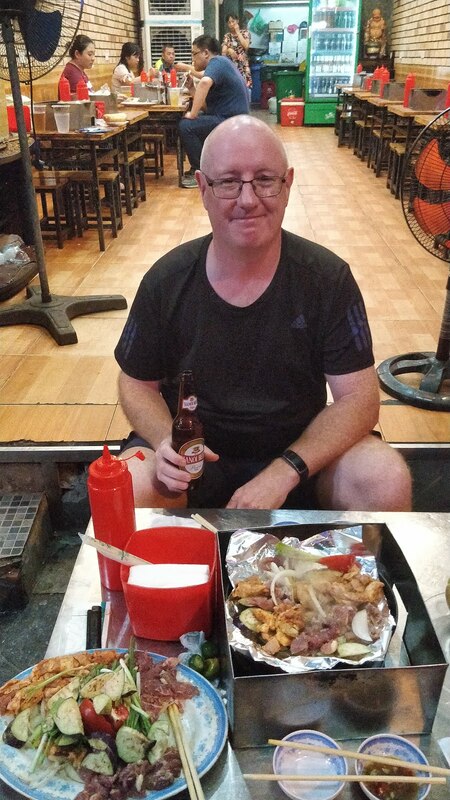 The food has been great through most of our Vietnam trip but a special mention needs to go the Vietnamese BBQ that we had whilst here. We went to a placed called 'Bo Nurong Xuan Xuan' which is located near pub street but loads of restaurants offer it and I'm sure it's the same everywhere. You perch on your little plastic stool with a large cooking stove / burner in front of you and on top is an iron skillet covered in tin foil. You then have a massive plate of meat and veg which you proceed to cook as fast or slow as you want to eat it. You can get Banh Mi rolls to help mop up the juices or make sandwiches and every so often as the foil gets a bit to mucky they will come and change it for you. It's best to cook in batches and completely remove it once cooked as trying to keep track of half cooked or freshly added raw meat when it's time to change the foil is impossible. It was delicious and we could have sat there drinking cheap bottles of beer and ordering extra plates for or BBQ all night but we were stuffed after 1 large plate. 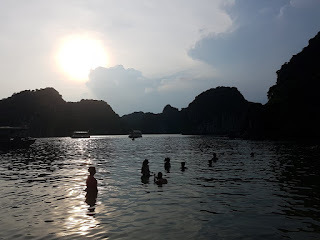 One of the things I really wanted to do whilst this end of Vietnam was visit Halong Bay, or the quieter Bai Tu bay, with all the hundreds of limestone karsts that jut out of the sea. 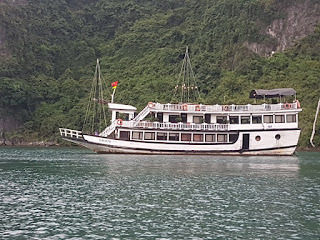 We’d already looked and tentatively booked a 3 day, 2 night cruise with Indochina, which looked amazing but was a lot of money and we were beginning to wonder if it was worth it. 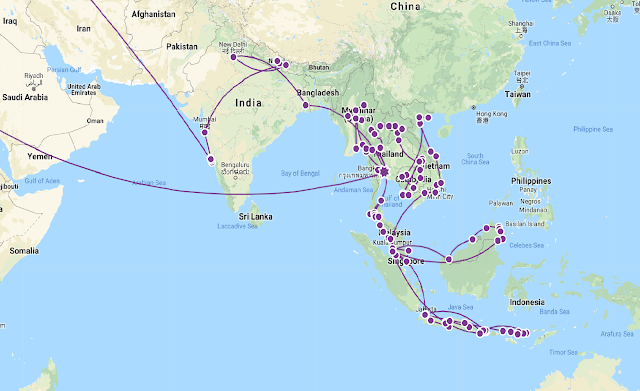 You could drive yourself insane looking up researching and comparing the cruises in this area, and most of them offer the same itineraries with the same style of cabin and the same food and drink offers but finally, after nearly going insane, we decided to go with Swan Cruises. They went to the preferred Bai Tu area but had slightly smaller live aboard boats (only 9 cabins), plus we could have a private balcony and all for a slightly cheaper price. The price of $480 for 2 nights is still crazy expensive but it did include pickup / drop off in Hanoi, all meals, some water, private a/c room with balcony and all ‘activities’ whilst on board. Fortunately, the hotel had agreed to look after our big backpacks as we were staying there 1 more night after the cruise, so we were able to pack a couple of nights clothes in our days bags and travel light. At 8am a small, smart looking minivan arrived to pick us up and a bouncy, smiley girl introduced herself as Daisy our rep. There was only 16 other people on the van by the time we set off on the 4 hour journey to Hon Gai Pier and surprisingly we were the only ones staying for 2 nights as everyone else was only staying 1. 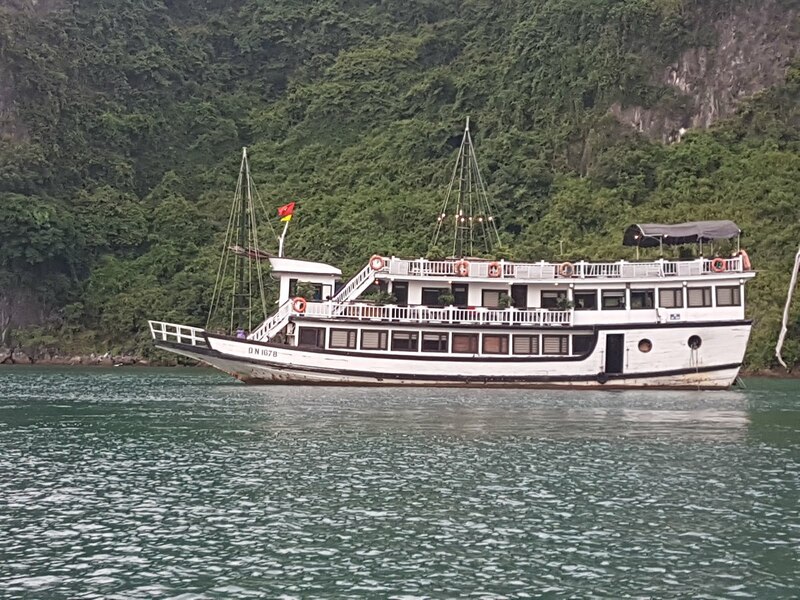 The way most of the boats doing these cruises work is that the main live aboard boat goes back to the harbour every day, so if you were staying 1 night you just stay on the main boat the entire time. 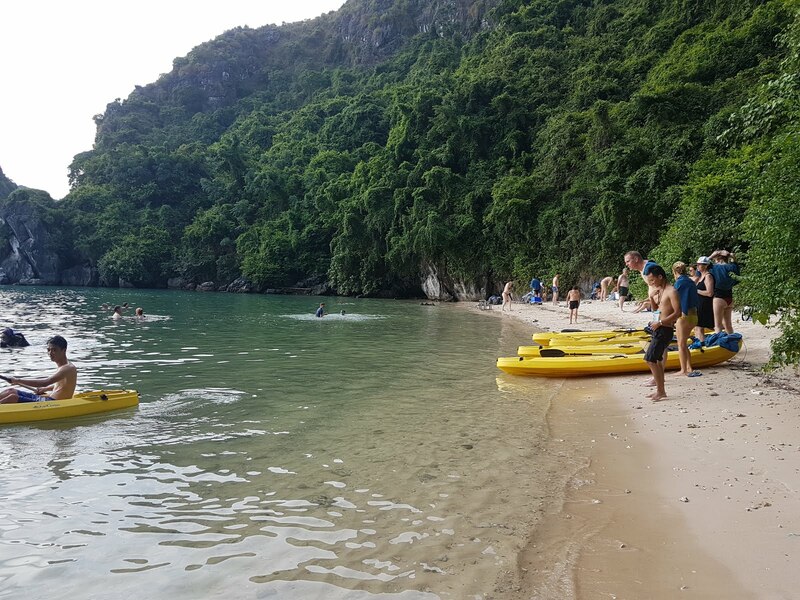 If you are staying 2 nights then on the first morning you transfer to a ‘day’ boat, which is smaller but can then take you off around a few sights whilst the other boat takes the others back, picks up new paying guests and then re-joins you later that afternoon. It’s a bit odd starting your cruise with one set of fellow guests and rep, then finishing it with a completely different group but it runs quite smoothly this way. Our cabin on board was a small but comfy double room on the 2nd floor, with a window right by the bed that meant you could watch the islands drift by. There was a a/c restaurant on the same level where they served all meals and then there was a large sundeck on the top, which is where you spend most of your time when not eating. The food on the cruise was amazing and it started with a 7 course lunch almost as soon as we’d got unpacked. 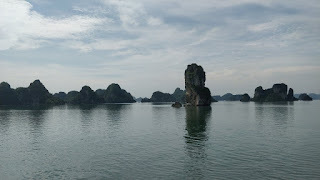 Whilst we ate and chatted to the other guests the boat starts to sails away from the chaos of the harbour and out into the middle of these huge jagged green covered rocks. It was so beautiful. 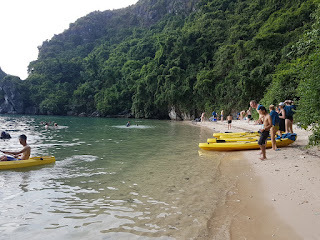 When the food eventually stopped coming, Daisy told us that we’d have an hour before we arrived at a kayak station, where we would kayak to a sheltered beach for some swimming. In the meantime we all wandered up to the top deck to admire the scenery go by. 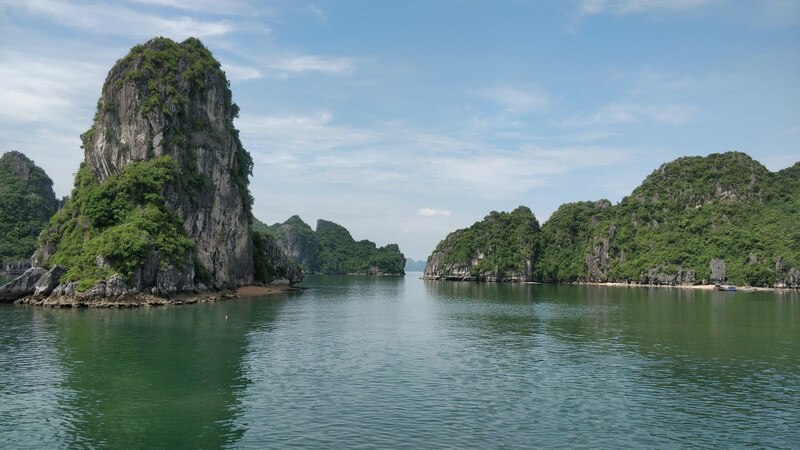 The water is by no means pristine, you can see crisp packets, bottles and larger nondescript items floating past you and it’s hard when looking out not to be able to see at least one bit of trash at any point, but the beauty of these karsts aren’t diminished by it. Another thing you notice in the water are a lot of these long tentacled jellyfish and we were warned that although not deadly they are very painful. Which is just what you want to hear before you head off for a swim! Around 4pm we headed off in the little boat to a kayak station, we’d never kayaked before but were thinking how hard could it really be? Famous last words as it was now up to poor Daisy to try and control our group of 7 kayaks and direct us in the same direction towards the beach. We managed to get there by taking the most zigzagged route possible and realised it was a lot harder than we’d thought it would be. The water was so warm that although I’d said I wouldn’t swim because of the pollution and jellyfish we’d passed, we both ended up taking a small dip before wimping out on kayaking back and getting the boat to take us directly back to our big boat. Almost as soon as you are back on board you are invited to the top deck for nibbles and a free glass of lemonade. As the drinks on the cruise are all chargeable any free-bees are gladly accepted, the nibbles I could have done without as I was still stuffed from lunch. The boat then drifts further in and out of the limestone rocks before you are summoned to dinner – which is another 7 course meal! One of the courses for this dinner is their signature steamed prawns which they cook in front of you in rice wine and serve with a special dipping sauce. Obviously, you can’t be expected to shell your own prawns, apply the right amount of sauce and feed yourselves, so this is done for you! A waiter in food prep plastic gloves comes to your table, deftly shells a large prawn before dipping it in the lime, salt and pepper sauce then hand feeds everyone at the table in turn. If you try to take it or guide it into your own mouth he takes it back until you learn to just sit there waiting for him to feed you. It was the weirdest thing. We were all so bemused and freaked out by this we forgot to get any pictures of this madness. It was really, really tasty though. After the meal Daisy does a few games where you can win free beer or you can try your hand at squid fishing. As we didn’t fancy doing any games we thought we’d try squid fishing, which just entailed holding a bamboo line with hook and lure over the edge of the boat and jiggling it. Unsurprisingly and probably fortunately we didn’t get any interest from any squid but I did offend a large fish who decided to nibble the line and consequently sent the hook and lure sinking to the bottom of the sea. Probably for the best as I’m not sure I’d have wanted to snag anything anyway. As we’d dropped anchor for the night and the only thing to see once the sun goes down is all the other twinkling lights from other boats, we retired to our cabin to read and chat before drifting off to sleep. Around 4am I am woken by a loud alarm type noise in our cabin. Not having a clue what it is but hearing it come from the a/c unit I turn it off and wait for the noise to stop. It’s only after a few more mins when I wake up a bit more that I realise the noise is a Cicada, which must have nestled himself inside the wooden box and is now singing to his hearts content. There is no way I can find him and as Paul is somehow managing to sleep through his repetitive song, the only thing to do is lie there for the next hour until he finally gives up calling his mates and goes quiet. By now it’s beginning to get light and I can hear the boat crew starting to wake up. It’s supposed to be Tai Chi on the upper deck at 6:15 am but as I can now also hear the wind and rain lashing down outside I’m quite happy to be snuggled in bed. At 8am you are called for breakfast which was half buffet style with free flow bacon, pancakes, toast and fruit with a chef on hand to cook eggs any way you would like. I can’t believe I’d read some comments on trip advisor saying the cruise food was rubbish and they were always hungry, I’ve never eaten so much! 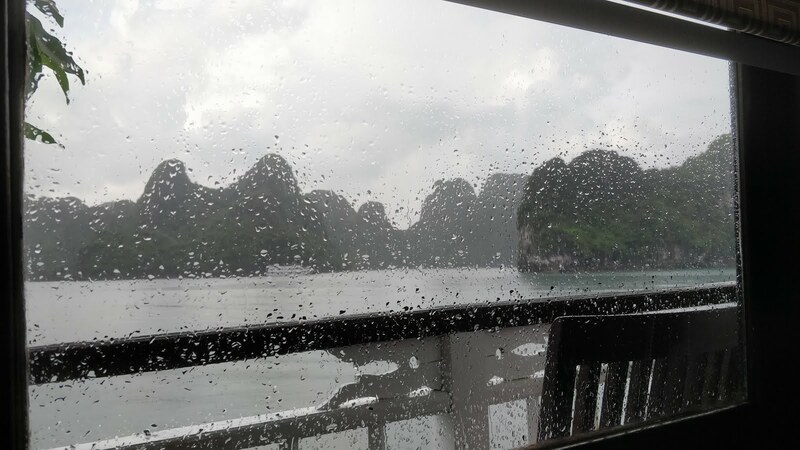 By 9am the rain had stopped and a small boat with 4 other guests from a different swan cruise arrived to pick us up for the day, so we waved goodbye to Daisy and the rest of the crew and we set off. The day boat that you go on for the 2nd day is a large boat that would normally take about 48 people but on this occasion there was only 6 of us on it and as we went away from all other boats and into the quiet waters and islands, the only way to describe it was magical. We sailed around the islands and went on an hour long kayak to a deserted cave, visited sheltered beaches, had another huge lunch, went to a floating fishing village and even stopped at an oyster pearl farm before meeting up with the main boat again about 3pm. The next few hours passed much as the previous day had as for the new guests this was their first trip into the bay. We didn’t partake in anymore activities as we both felt like we’d seen the best the bay had to offer already and were happy to buy a couple of over-priced beers and sit on the sun deck watching the light fade. Another free lemonade and nibbles on the top deck, followed by 7 dishes and we were set for bed. I wish I’d got up for Tai Chi the next morning as apparently, they saw monkeys on one of the islands but after being woken by Cedric the Cicada again in the night I slept through til 7am. The morning activities on the last day are pretty much food related as you have breakfast at 8am, then pack and check out of your cabin (this gives the staff time to clean and change bedding before we get back to the harbour), then it’s cooking demo where you make fresh spring rolls then another 5+ dishes for lunch! It’s a shame that you are back at the ugly harbour by the time lunch is served but I understand why because the new customers will be on board within a couple of hours and everything needs re-stocking and cleaning. We ended up with over 300 pictures from this stunning cruise which we’ve had to painstakingly go through and vet but even with the extra admin time and the cost involved it was so worth it. Once back in Hanoi and re-united with our backpacks we did the only thing you’d expect us to do on our last night in Vietnam…..we hit pub street for farewell drinks. Our flight the following day wasn’t until 3pm, so we had a bit of time to nurse our hangovers and find some really good posh nosh at the Downtown Cafe before getting a taxi to the airport. Thank you Vietnam…you were awesome.